The gods are at war! 1,136 Indian churches unite! The gods are at war! India is the second largest country in the world with a population over 1.2 billion people. For over 4,000 years India has been under the control of the satanic dark gods of Hinduism, which claim over 330 million different “gods.” Over 82% of the people in India are Hindu, and their society operates within a national caste system that believes you are born (reincarnated) into your particular “social class” based on how many good “deeds” (Karma) you did in your previous “lives.” In other words, reincarnation and Karma are the foundation of Hinduism in India, and these millions of dark Hindu gods are at war with the One True God of Light for the souls of men, women, and youth throughout India. We are going there to help set many souls and lives free! The war is over, the God of Israel has defeated these millions of dark gods and we are going to proclaim light, freedom, victory, and eternal life in the Name of Jesus Christ! Please join us in prayer for the souls of the Indian people we will reach September 19-21 in Machilipatnam, an area on the east coast of south central India. The word spread rapidly after we began mobilizing and training local churches many months ago for this project that consists of a full-day Leadership Development Conference (LDC) and a two-day regional Crusade. Now there are 1,136 churches involved in this project! Due to this large number of churches joining together, we could see up to 3,000 pastors and church leaders attending our LDC, and attending and bringing people to the crusade. Yet, as of today, we only have the budget for 1,000 church leaders to attend. So, as God provides, we will do our best to encourage, love, train, and equip as many Indian church leaders as the budget allows. We are praying for the Lord to provide an additional $12,000 so we can bring in, train, feed, and give resources to the additional 2,000 pastors and church leaders. Another opportunity we have in India is to print our own unique Gospel salvation tracts that our India Coordinator wrote. These tracts were written with a full understanding of the Indian culture, which means a higher percentage of Hindus will read them, keep them, and pass them to family and friends. The cost for 100,000 of these custom-made tracts is $4,000. In addition, as we are able, we will also give Bibles to pastors and church leaders who attend our conference. We are not allowed to take Bibles and Christian materials into India, so we will be purchasing the Word of God on location in the local Telugu language. God willing, we hope to purchase 3,000 Bibles for $6,000. It is because of you, our caring partners, that we will see many Indian families, youth, and children set free from darkness by Jesus Christ! And, what a joy it will be to watch the Lord strengthen the Indian Body of Christ throughout the Machilipatnam region! Thank you for your support and for lifting these needs up in your prayers! Summer is here! Many of us will be with family and friends celebrating the warmth and fun of summertime over the next few weeks. As you go about your plans, please know how grateful I am for all your support! Some of our dear friends in India—our coordinator and his wife—were recently struck with heatstroke as the temperatures went beyond 120 degrees! Over 500 people throughout India have died the past four months from heatstroke. Can you imagine living in that type of heat day after day with little or no air-conditioning? 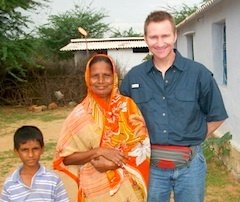 Please team with us in prayer for our co-laborers in India! Once the severe heat subsides, we are traveling to India next month to conduct a two-day, region-wide, evangelistic crusade. 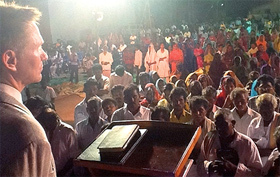 Church leaders from hundreds of local churches were equipped by our India coordinator to train their congregations to bring non-Christian friends and family to hear the Good News of Jesus Christ at the crusade! And, we have been told they are expecting a great turnout of church leaders for our Leadership Development Conference! Many, if not most, of the church leaders attending are from tiny churches and in need of encouragement and love. We look forward to sharing our hearts and lives with our brothers and sisters in Christ, along with presenting focused training sessions and giving each attendee ministry resources. 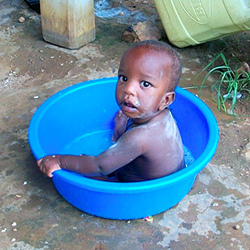 Plans continue to move forward for Stage 1 of our South Sudan project this October! We are taking a team of Bible teachers and preachers to speak at our extensive 3-day Leadership Development Conference. Due to a gracious contribution of literature from the missions department of my home church, Houston’s First Baptist Church, we will distribute 5,000 booklets of discipleship materials to those who attend the conference! Thank you, my caring home church, for helping us “to equip the saints for the work of ministry, for building up the body of Christ” (Ephesians 4:11-12). At this moment, I come to you humbly and boldly and personally…to let you know that we need help—your help—and I am asking you to please consider sending our ministry a financial gift today, the most sacrificial and generous donation that you can. Giving typically goes down during the summer because people focus on vacations and other personal expenses, yet the Kingdom of God still goes on because throughout the world people are dying daily without Jesus Christ! We have taken a step of faith for these upcoming projects in India and South Sudan and the Lord will provide! I have been praying earnestly for God’s Spirit to move the hearts of His people to join us in this step of faith so that women, men, youth, and children in India and South Sudan can have the opportunity to hear the eternal, life-changing message of Jesus Christ! Thank you for walking by faith with us and for giving by faith to send us!